Akosua Afriyie-Kumi knew nothing about weaving, let alone running a business, when she stumbled across a community in northern Ghana twisting raffia into baskets to sell on the roadside. But the 31-year-old Ghanian, who had studied fashion in London, knew she'd spotted an opportunity. She set up AAKS, making ritzy raffia bags that combine traditional weaving techniques with modern designs. Three years on, her bags are on sale in some Urban Outfitters stores in the U.S.
"Now I sell in 46 stores in 16 countries around the world, and I've only been in business since 2014," she says. Afriyie-Kumi might not have known much about business when she started out, but she did know how to work her social networks. 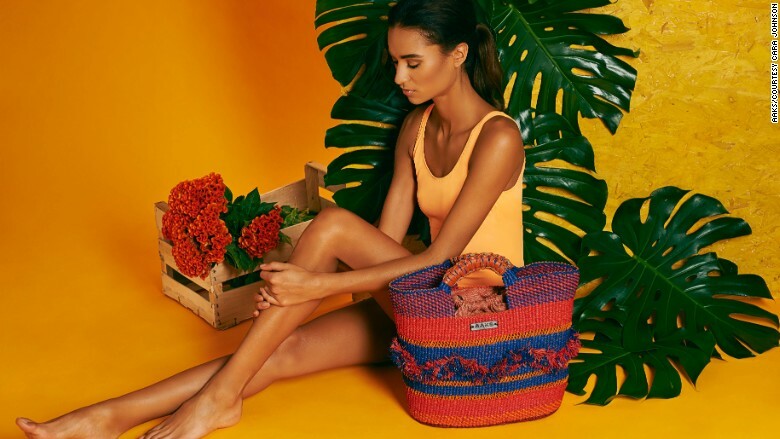 It didn't take long for her raffia bags to gain traction on Pinterest, and from there come to the attention of U.S. retailer Anthropologie. "To get a call almost three months after launching from Anthropologie was one of the greatest moments of my brand," says Afriyie-Kumi. Impressed with the quality of the bags, Anthropologie recommended AAKS to Urban Outfitters (URBN) (both subsidiaries of URBN brands), which included her in its Spring/Summer 2016 collection. From this month, Urban Outfitters will stock her new collection in its Miami and Hawaii stores. Her business quickly expanded from three to 30 weavers to meet the rising demand. 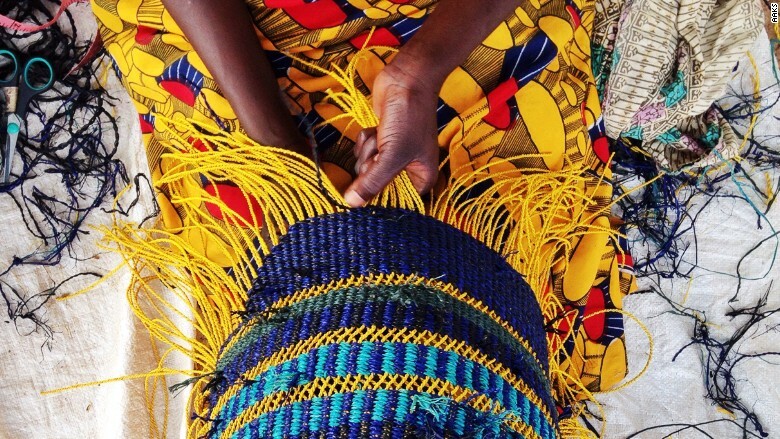 Each bag can take over a week to make, as raffia palms are taken from the south to the north of Ghana, where they are twisted into strands by hand and dyed using organic coloring. Once dry, the weaving begins. Bags sell for between $70 and $270 and Afriyie-Kumi says that she limits production to a maximum of 200 bags a month, to ensure quality and ethical production. "A lot of stores are surprisingly OK with us not over-producing, as our bags become more exclusive," she says. 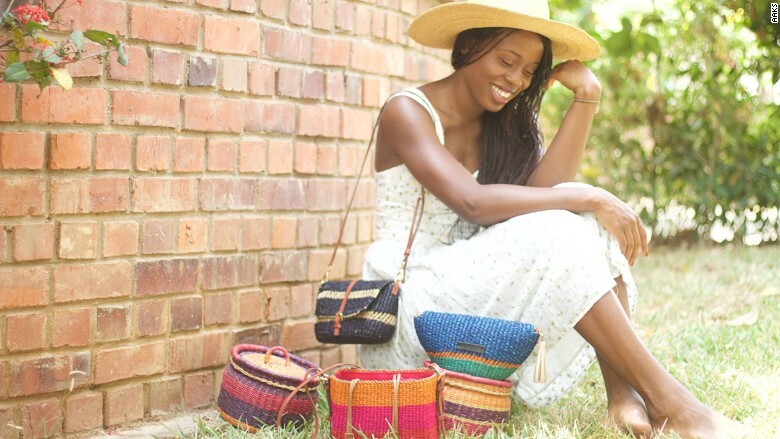 Akosua Afriyie-Kumi with an assortment of AAKS bags. The bags are sold to individuals via social media, as well as to ethical fashion boutiques in London, Cape Town and Singapore, among others. In addition to Urban Outfitters, Japanese brand United Arrows started selling AAKS bags in January this year. Afriyie-Kumi says that since the beginning, she has involved the weavers in the process of designing and creating. "The community has formed a huge part of what I do," says Afriyie-Kumi. "We tag all our bags with the names of the weavers, which gives that direct connection to the customer as well."